When travelling on long-haul flights there are a plethora of advantages to flying in Business Class. With comfortable beds, exceptional dining, access to the lounge and improved amenities, Business Class really is taking off. With American Airlines (AA) they have a next generation Business Class which is available on all of AA’s 767 300’s and 777’s. One of the main advantages of Business Class over Economy Class is that you often get a seat that converts into a bed. 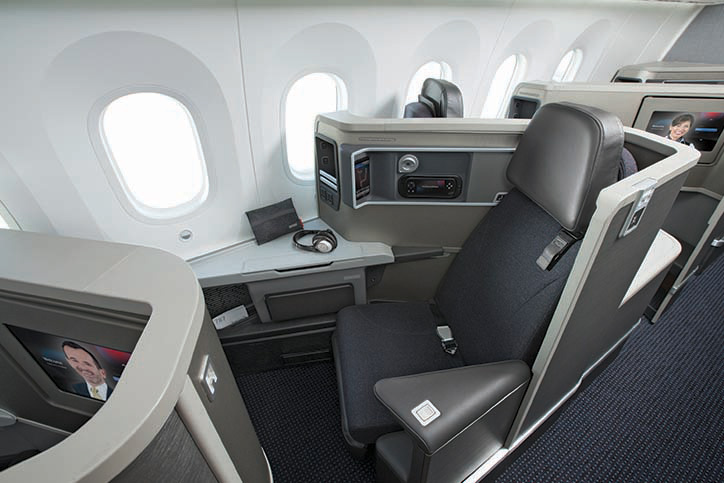 AA’s next generation international Business Class cabin features motorised seats that can become fully-flat beds including both the pre-set and manually controlled positions types. On the Boeing 767, Boeing 777 and select International Boeing 757, you’ll also be provided with a soft cotton cabin duvet designed for both warmth and comfort, so you can get a good night’s sleep throughout the journey. Seats are equipped with conveniently located power ports so you can keep your electronics charged up in the air, plus they offer additional legroom and a six-way adjustable leg rest for greater comfort. The innovative tray table design incorporates two separate tables. One drops down from the seat back and a second lifts from the center console, so you can use each separately or lock them together for one large work or dining surface. In addition, a privacy divider between the seats can be raised for additional privacy as well as shoulder room, especially when in a reclined or bed position. In all cabin classes passengers have access to 260 movies, 240 TV shows, 400 music selections, 40 radio channels, 20 games and live sport streaming from Sport24. The difference is that in Business Class (and First Class) you’ll be treated to complimentary Bose QuietComfort 25 Acoustic Noise Cancelling headphones to ensure distraction-free viewing. On select flights, such as the Boeing 767-300, you’ll have a Samsung Galaxy Tab instead, loaded with new movie releases, hit TV programs, games, music and best-selling book excerpts. One of the perks of flying Business Class is little extras such as amenity kits packed with useful items to use during the flight. Inside your AA International Business Class amenity kit you’ll find a toothbrush, toothpaste, eyeshade, socks, earplugs, C.O. Bigelow Apothecaries products (lip balm, Lime & Coriander body lotion and mouthwash), tissues, pen and foam headphone covers. All AA amenity kits feature a custom bag designed by Cole Haan, inspired by their pinnacle design and innovation collection, ZerøGrand. The international Business Class amenity kit includes a Dopp Kit design available in eight different colour combinations, which will be introduced in four rotations, ending in March 2017. While you will be treated to an amenity kit you won’t be supplied with any pyjamas in Business – these are reserved for First Class passengers only. AA’s Business Class passengers enjoy a personalised service and expanded selection of menu options served on modern china and tableware. The choice of fare varies depending on when and where you are traveling, and you have the option to reserve your meal choice any time between 30 days and 24 hours before your flight departure. On flights to Europe your meal could start with a drink of your choice and a blend of warm mixed nuts, followed by a starter such as fresh mozzarella and prosciutto or beetroot and goat cheese ravioli. To follow, your menu might include entrées like peppered beef fillet served with smoked mac and cheese, rosemary orange grilled chicken with cauliflower gratin or grilled salmon with caper lemon butter, primavera rice and grilled zucchini. And for dessert? A made-to-order ice cream sundae with seasonal berry toppings, hot fudge, butterscotch, pecans and whipped cream. You can also opt for warm pecan tart or a gourmet cheese plate along with a fine cordial. To accompany the meal, you’ll also be able to choose from a list of award-winning wines which have been hand-picked according to the particular destination. All alcoholic beverages, including spirits, are complementary in Business Class, unlike in Economy where only wine and beer are complimentary on flights between U.S. and Europe, Asia, Australia and select Latin American countries. Want to know more about which planes offer a more comfortable experience? We’ve created a handy guide AA’s aircraft types that offer Business Class. If you’d like to try their service for yourself, SkyClub can arrange your flights cheaper than booking with the airline direct. Simply call 0207 255 1234 or contact us via the website.